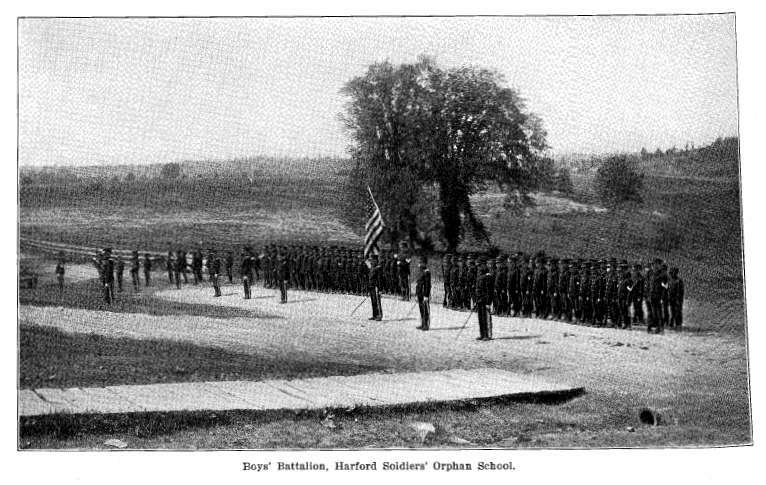 The book, "Annual Report of the Pennsylvania Commission of Soldiers' Orphan Schools, for the Year Ending May 31, 1901," by William S. Ray, State Printer of Pennsylvania, 1901. 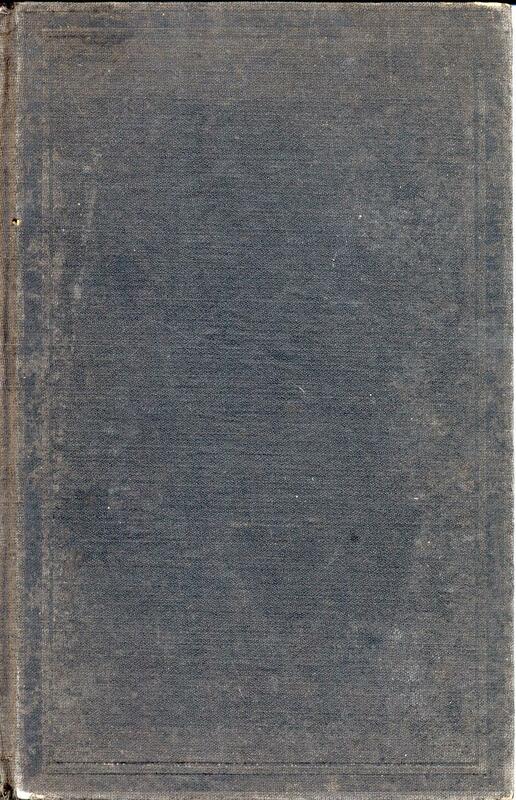 This book is a report on the orphan's living within the state-run Soldiers' Orphan Homes. 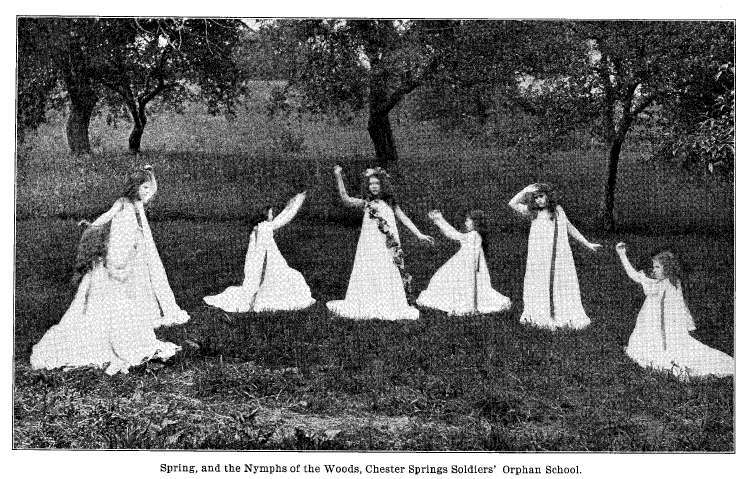 It covers orphaned children being raised at the Chester Springs, Harford, [Scotland] Industrial, and Uniontown orphan schools. 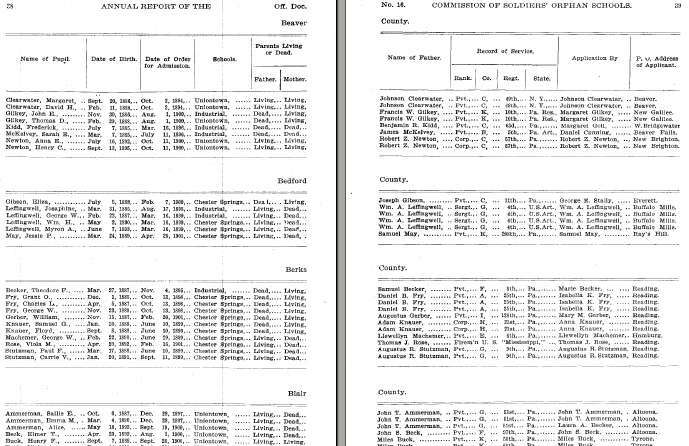 The book lists all the staff members, all of the orphans within the system as of May 1901, the orphaned children's parents names, and the referrer's name. The book has approximately 140 pages and has a Table of Contents. It is not indexed, though the lists are in alphabetical order, by county, and the Adobe Search function is fully enabled. Please note: This is not a paper book, it is a scan of the original paper book into the digital Adobe PDF format, written on a CD-ROM. You read this book on your computer using the free Adobe Reader software. It is a digital version of a hard to find book. If you could find a copy of the 1901 printed book, it would be very expensive. Adams County, Allegheny County, Armstrong County, Beaver County, Bedford County, Berks County, Blair County, Bradford County, Butler County, Cambria County, Cameron County, Carbon County, Centre County, Chester County, Clarion County, Clearfield County, Clinton County, Columbia County, Crawford County, Cumberland County, Dauphin County, Elk County, Erie County, Fayette County, Franklin County, Fulton County, Greene County, Huntingdon County, Indiana County, Jefferson County, Juniata County, Lackawanna County, Lancaster County, Lawrence County, Lebanon County, Luzerne County, Lycoming County, McKean County, Mercer County, Mifflin County, Monroe County, Montgomery County, Montour County, Northampton County, Northumberland County, Perry County, Philadelphia County, Potter County, Schuylkill County, Snyder County, Somerset County, Susquehanna County, Tioga County, Venango County, Warren County, Washington County, Wayne County, Westmoreland County, Wyoming County, & York County. 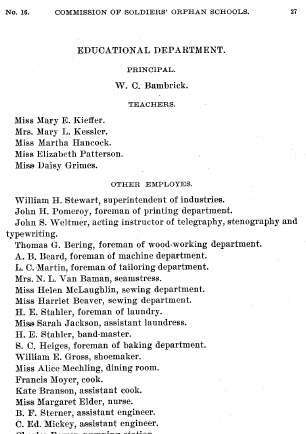 This is a list of orphans and staff mentioned in the book. 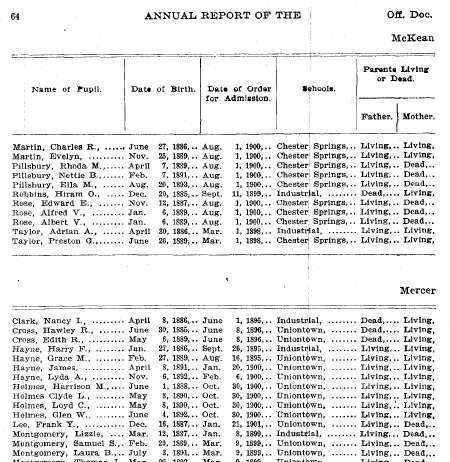 The orphan/student lists include date of birth, father's name, father's military association, referrer's name, home address when inducted, and whether the parents were living or dead. David Adams, Ellsworth Adams, Flora Adams, Ida Adams, May Adams, Milo Adams, Reverdy Adams, Thomas Adams, Amos Albright, Emma Albright, Mary Albright, Walter Albright, Jesse Alcorn, Wade Alcorn, Bertie Allen, L. F. Allen, Lorenzo Allen, Charles Allison, Mable Allison, Margaret Allison, William Allison, Alice Ammerman, Emma Ammerman, John Ammerman, Lloyd Ammerman, Robert Ammerman, Sallie Ammerman, Chester Anderson, George Anderson, Nettie Anderson, Joseph Andrews, Percy Andrews, Benjamin Armstrong, Bertha Armstrong, Boyd Armstrong, Edmund Armstrong, John Armstrong, Robert Armstrong, William Armstrong, Clark Arnold, George Arnold, Joseph Arnold, Samuel Arnold, Isaiah Ashbridge, Isaiah Ashbridge, William Ashbridge, George Ashenfelter, Raymond Ashenfelter, Jefferson Atkinson, Ralph Atkinson, David Avery, Edna Avery, Martha Ayers, Samuel Ayers, & Sherman Ayers. Carrie Babcock, Daniel Babcock, Ida Babcock, Richard Bailey, Samuel Bailey, Clarence Baker, Clyde Baker, John Baker, Minnie Baker, Abram Baldwin, Mary Baldwin, S. B. Bambrick, W. C. Bambrick, Daniel Barner, James Barner, Albert Barnes, John Barnes, Edward Barney, Glenin Barney, Violet Barney, Frank Barrett, Cyreno Barrowcliff, Nellie Barrowcliff, Calvin Basim, Clara Basim, Frank Basim, Ida Bath, R. R. Bauer, Alta Baugher, John Baugher, Thomas Baugher, Bessie Baughman, David Baughman, Katie Baughman, Nellie Baughman, Alford Beacher, John Beacher, William Beacher, A. B. Beard, Harriet Beaver, Maude Bechtel, Napolean Bechtel, Elmer Beck, John Beck, Samuel Becker, Theodore Becker, Frederick Bee, Jacob Bee, Reuben Beerbrower, James Beeson, Myrtle Beeson, Christian Bender, Elder Bender, Thomas Bering, Fannie Bernhard, Frank Bernhard, Lewis Bernhard, Lizzie	Bernhard, Andrew Berry, James Berry, Joseph Bice, Mary Bice, Moses Bice, William Bice, Hiram Bird, Nellie Bird, George Bishop, Ida Bishop, John Bishop, Joseph Bishop, Ralph Bishop, William Bishop, John Black, Johnston Black, Stella Black, James Blackledge, John Blackledge, Esther Blain, John Blain, Harry Blake, William Blake, Montgomery Bochert, Ossie	Bochert, Solomon Bochert, Daniel Bohrman, James Bohrman, John Bohrman, Lewis Bohrman, Rosa Bohrman, A. R. Bolmar, Ephraim Boring, George Boring, Maggie Boring, Clara Borland, James Borland, Thomas Borland, John Bowen, Kenneth Bowen, Charles Bower, Jacob Bowers, Josephine Bowers, William Bowers, Alice Boyce, Joseph Boyce, Louise Boyce, James Boyer, Leo Boyer, Washington Boyer, Frank Boyles, Urben Boyles, James Bradley, Philip Bradley, Theodore Bradley, Ida Brady, James Brady, Kate Branson, Helen Breese, John Breese, William Bricker, Margaret Brisbin, Charles Britton, George Britton, Israel Britton, Jonas Britton, F. W. Brizzy, Francis Brizzy, Maud Brizzy, Clarissa Broat, John Broat, William Broat, Adam Brobst, John Brobst, Magdalina Brobst, John Brookens, Samuel Brookens, Annie Brooks, George Brooks, Sumner Brooks, Wesley Brooks, Charles Broome, Charles Brown, Ethel Brown, Geneva Brown, Harry Brown, Maude Brown, Nathan Brown, Phena Brown, Jacob Brownback, David Bryant, Willie Bryant, Ella Buchman, George Buchman, James Buchman, Henry Buck, Miles Buck, Viola Buck, Barbara Buckwalter, Blanche Buckwalter, George Buckwalter, Jesse Buckwalter, Lena Buckwalter, Helen Buohl, David Burgess, Frank Burgess, John Burk, Clarence Burns, Redding Burns, David	Burtner, George Butler, Harrison Butler, James Butler, Joshua Butler, Webster Butler, George Byers, & John Byers. Davis Calhoun, Ernest Calhoun, Grace Calhoun, Priscilla Calhoun, Robert Calhoun, Alvin Callen, Clyde Callen, Philo Callen, Samuel Callen, Henry Callender, Judson Callender, John Campbell, Cloudy Canann, Richard Canann, Christian Carbaugh, Sarah Carbaugh, Frank Carew, Grace Carew, William Carew, Jabez Carey, Arthur Carmichael, Benjamin Carmichael, Hannah Carmichael, John Carmichael, Joseph Carmichael, Clayton Carpenter, Josephine Carpenter, Mildred Carpenter, Emma Castor, William Castor, Albert Cessna, Edith Cessna, Emma Cessna, George Cessna, Leroy Cessna, Calvin Chamberlain, Elsie Chamberlain, Harry Chamberlain, John Chamberlain, Mary Chamberlain, George Charlton, Roy Chase, William Chase, Edward Chatham, George Chatham, Thomas Chatham, George Childs, James Childs, Francis Chilson, Leon Chilson, Rosetta Chilson, John Clark, Nancy Clark, Richard Clark, Robert Clark, Samuel Clark, Theodore Clark, David Clearwater, Johnson Clearwater, Margaret Clearwater, Malon Cleveland, Ralph Cleveland, Edgar Clews, Joseph Clews, Isaac Cline, John Cline, Julia Cline, Mable Cline, Alton Cobb, Raymond Cobb, Agnes Coggains, Helen Coggains, John Coggains, Josephine Coggans, Michael Coggans, Timothy Coggans, Cassie Cole, Ellen Cole, Evan Cole, Israel Cole, Jacob Cole, Meriam Cole, Nettie Cole, Okie Cole, Philip Cole, Rufus Cole, William Cole, Earl Coleman, Jennie Coleman, Oddley Coleman, W. H. Coleman, William Coleman, Ira Collar, L. L. Collar, Carrie Collins, Mathew Collins, Matthew Collins, Thomas Collins, William Collins, Alanson Conrad, Florence Conrad, James Conrad, Edna Cook, John Cook, John Cooney, Thomas Cooper, Francis Coover, George Coover, Seth Coover, Adelbert Corey, Clarinda Corey, James Corey, Charles Corkey, Walter Corkey, William Coulter, Pardon Covey, William Covey, Clarence Craig, Daniel Craig, Earley Craig, Emanuel Craig, Ida Craig, Burrell Cramer, Edith Cramer, Mathias Cramer, Mattie Cramer, Albert Crawford, Alexander Crawford, Charles Crawford, Ellen Crawford, James Crawford, Samuel Crawford, Marion Croft, Theron Croft, Florence Cromer, John Cromer, Edith Cross, Hawley Cross, John Crow, Nelson Crow, Charles Culver, Samuel Culver, George Curns, Robert Curns, Maggie Currie, Robert Currie, Sarah Currie, Jacob Custer, & John Custer. Catherine Dailey, Ellen Dailey, Patrick Dailey, William Dailey, Raymond Darling, Wilmer Darling, Alfred Darte, John Davies, Benjamin Davis, Cora Davis, Harrison Davis, John Davis, Moses	Davis, William Davis, Frederick De Long, Mary De Long, Arthur De Swan, John De Swan, Bertha Dearfield, Georgia Dearfield, Michael Dearfield, Susie Dearfield, James Decker, Randolph Decker, Wesley Deitrich, Annie Deitz, Cora Deitz, David Deitz, Albert Denning, Harriet Denning, Harry Denning, Godfrey Dent, Kate Dent, Phoebe Dent, Thomas Dent, Chatherine Denworth, James Denworth, Raymond Denworth, Carmel Devine, John Devine, William Devine, Katie Dietrich, Charles Diggins, Glennie Diggins, Jesse Diggins, Louclene Diggins, Hector Dinah, Thomas Dinah, Sarah Diseroad, Anna Disler, Charles Disler, Wyent Disler, Albert Dodge, Alfred Dodge, George Dodge, Elmer Dodson, Harriet Dodson, Samuel Dodson, Azilda Dondt, Francis Dondt, Peter Dondt, Jacob Donges, Robert Donges, Gertrude Duffy, James Duffy, Andrew Dugan, Curtis Dugan, Otto Dugan, Martin Dunlap, Sherman Dunlap, Curtis Dunn, Elizabeth Dunn, Thomas Dunn, Charles Durfer, & Henry Durfer. George Eaton, William Eaton, Henry Eckenroad, Robert Eckenroad, Cora Edwards, Isaiah Edwards, Harry Edy, Henry Edy, Margaret Elder, Daniel Emminger, Iva Emminger, John Emminger, Benjamin Engle, Goldie Engle, Henry Engle, Joseph Engle, Nora Engle, Harrison English, Stella English, Enos Enslin, James Enslin, Joseph Enslin, Norman Enslin, Sadie Enslin, Susan Enslin, John Epley, Ruth Epley, Edward Ernest, Henry Ernest, Dora Estep, Frank Estep, Henry Estep, Loma Estep, Carrie Etter, Edna Etter, Jacob Etter, Julia Etter, Earl Evans, George Evans, Glenn Evans, Harry Evans, Jane Evans, John Evans, Alice Everhart, Foster Everhart, Charles Everson, & Herman Everson. Almira Fackender, Bertha Fackender, Ethel Fackender, John Fackender, Mary Fackender, William Fackender, Erwin Faister, Joseph Faister, James Farmer, Mary Farmer, Samuel Farmer, Edith Farrar, George Farrar, John Farrar, Andrew Feige, Julius Feige, Cora Field, George Field, Harry Field, Edgar Fisk, Ira Fisk, Mary Flanagan, Matilda Flanagan, Michael Flanagan, Josiah Fleeger, Max Fleisher, Maxmillion Fleisher, Frank Fleming, J. J. Fleming, Dwight Fohner, Enoch Fohner, Frankie Folsom, Hiram Folsom, Harry Foltz, James Foltz, John Ford, Colin Forsythe, David Forsythe, Jacob Fortney, Lloyd Fortney, Alice Foster, Frederick Foster, Irwin Foster, Jeremiah Foster, John Fowler, Ella Fox, William Fox, Charles Franklin, John Franklin, Hood Frederic, Jessie Frederic, John Frederic, Nellie Frederic, Charles Frederick, George Frederick, Albert Frehafer, Edward Frehafer, Elhannon Frehafer, Frank Frehafer, Alice French, Charles Frick, Mabel Frick, Bertha Frings, Edward Fritz, Nathan Fritz, Levi Froman, Thomas Froman, Charles Fry, Daniel Fry, George Fry, Grant Fry, Henry Fry, John Fry, Grover Furl, & Jonas Furl. Earl Gardner, Helen Gardner, Henry Gardner, Jesse Gardner, Charles Garis, William Garis, Isaac Garman, Polly Garman, Benjamin Gathany, John Gathany, Blanche Gebhardt, Herman Gebhardt, William Gebhardt, Hattie Geiger, Josiah Geiger, Augustus Gerber, William Gerber, Eliza Gibson, Joseph Gibson, Francis Gilkey, John Gilkey, Thomas Gilkey, George Gillespie, William Gillespie, Harry Gist, William Gist, Christian Glockler, Harvey Glockler, Albert Goebel, Grover Goebel, Bertha Goller, Thomas Goodman, Charles Goodwin, George Goodwin, Charles Goss, Cyrus Goss, Frederick Goss, Herbert Goss, Franklin Granger, Mable Granger, Jacob Graybill, Scott Graybill, David Green, Ellen Green, Martha Green, Mary Green, Earle Greene, Milton Greene, Roca Greensweig, William Greensweig, H. E. Gress, Howard Griffith, William Griffith, David Griffiths, George Griffiths, Ada Grim, John Grim, Joseph Grim, Samuel Grim, Daisy Grimes, Andrew Groner, George Groner, William Gross, Lottie Grover, Reuben Grover, W. W. Grover, Daniel Grow, Edwin Grow, Amy Guise, George Guise, & Samuel Guise. Charles Hackett, Harry Hackett, Emma Hafley, Mamie Hafley, Uriah Hafley, Ida Haines, Oliver Haines, Mary Halderman, Charles Hallock, Flora Hallock, T. A. Hambright, Mary Hamilton, Martha Hancock, Beatrice Haney, Edith Haney, John Haney, Margaret Harbaugh, Eliza Hardy, Herbert Hardy, Ira Hardy, Jennie Harkness, George Harlos, Ira Harlos, Arden Harman, Jacob Harman, Christopher Harmon, Edgar Harmon, Solomon Harmon, Clarence Harris, Florence Harris, Henry Harris, Lewis Harris, Clarence Hart, Isaac Hart, F. H. Hartweg, Fred Hartweg, Eliza Hatch, John Hatch, James Haus, Jacob Hawk, Mamie Hawk, Albert Hayne, Grace Hayne, Harry Hayne, James Hayne, Lyda Hayne, George Hazlett, John Hedden, Joseph Hedden, Wilbur Hedden, David Heeter, James Heeter, Thomas Heeter, George Henderson, Richard Henderson, Arthur Henry, Samuel Henry, Michael Herlinger, William Herlinger, Michael Herlinger, Jr., George Heysham, Logan Heysham, Mabel Heysham, Grace Hicks, Jennie Hicks, Lewis	Hicks, Mary Hicks, Amos Hidecker, Jesse Hidecker, John Hidecker, James High, Robert High, William High, John Hilliard, Jonathan Hilliard, Leon Hilliard, Avery Hilton, Mable Hilton, Max Hilton, Peter	Hilton, William Hilton, Jacob Hines, Julia Hines, Martha Hines, Otto Hines, Ida Hoadley, James Hoadley, Mary Hoadley, Franklin Hoffner, Jonathan Hoffner, Margaret Hoffner, Bertha Holgate, Barby Holland, Oliver Holland, Springer Holland, Clyde Holmes, Glen Holmes, Harrison Holmes, Loyd Holmes, Peter Holmes, James Holt, Caroline Holzer, Frank Holzer, Frederick Holzer, John Holzer, Margaretta Holzer, William Holzer, Harry Hoopengardner, Arlington Hoover, Joseph Hoover, Oscar	Hoover, Edward Hopkins, Hugh Hopkins, Mary Hopkins, Aaron Hopple, George Hopple, John Hopple, Joseph Horton, William Horton, Edgar Howard, Samuel Howard, Annie Hoyer, Benuel Hoyer, Ellie Hoyer, Mabel Hudson, Ovando Hudson, Daniel Hunter, James Hunter, L. Hunter, George Hutchinson, & Linford Hutchinson. Abram Ide, Dolly Ide, Edna Ide, Joseph Ide, Blanche Irvin, Edward Irvin, George Irvin, Hiram Irvin, Maggie Irvin, Minnie Irvin, & Reuben Irvin. Carrie Jackson, Clarence Jackson, Henry Jackson, Joseph Jackson, Nellie Jackson, Rhoda Jackson, Sarah Jackson, Thomas Jackson, Alexander James, Benjamin James, Ethel James, John James, Ulysses James, Harold Jauss, Daniel Jobes, Grover Jobes, Anthony Johnson, Clare Johnson, Edward Johnson, Jennie Johnson, Philip Johnson, William Johnson, Hillery Johnston, James Johnston, Adriana Jones, Carrie Jones, Estella Jones, Evan Jones, Francis Jones, George Jones, Harold Jones, Henry Jones, Ida Jones, James Jones, Jonas	Jones, Robert Jones, Sadie Jones, Stella Jones, William Jones, Anthony Jordan, Gertrude Jordan, Joseph Jordan, Charles Jordon, Harry Jordon, Jessie Jordon, Joseph Jordon, Joseph Jumper, & Urias Jumper. John Kaiser, Edna Kauffman, Jacob Kauffman, Maud Kauffman, Page Kauffman, Paul Kauffman, Spray Kauffman, Beulah Keagle, Ira Keagle, David Kearney, George Kearney, Adeline Keiner, Luther Keiner, William Keiner, Ada Keiser, Emanuel Keiser, Andrew Kelley, Frank Kelley, Catherine Kelper, Gaswin Kelper, Charles Kennedy, Priscella Kennedy, Rudolph Kennedy, Samuel Kennedy, Edith Kent, Mary Kent, William Kent, Adelbert Kenyon, Florence Kenyon, Pearl Kenyon, William Kenyon, Annie Kerby, George Kerby, Lillie Kerby, Simon Kerby, Mary Kessler, George Kevitt, William Kevitt, Dwight Keys, George Keys, Henry Keys, Ira Keys, Novella Keys, Benjamin Kidd, Frederick Kidd, Mary Kieffer, Henry Kifer, Louis Kifer, James Kimmel, Viola Kimmel, Lettie King, Maud King, Valentine King, Annie Kingsley, David Kirkland, Laura Kirkland, Lydia Kirkland, John Kiser, Orlando Kiser, Walter Kiser, Amanda Kletter, Ernest Kletter, Frederick Kletter, Julia Kline, Lewis Klinetop, Lucinda Klinetop, Job Knapp, Theodore Knapp, Adam Knauer, Floyd Knauer, Samuel Knauer, Jacob Knecht, Joseph Knecht, Henry Knier, James Knier, Rachel Knier, Elizabeth Koons, F. X. Korherr, Annie Kramer, Carrie Kramer, Francis Kramer, J. E. Kratzer, John Kratzer, James Krunkleton, Joseph Krunkleton, Benjamin Kulp, Clara Kulp, Daniel Kulp, & Laura Kulp. C. H. LaClair, John Laform, Levi Laform, William Laform, Carrie Lair, Henry Lair, Harvey Lamberson, John Lamberson, Lloyd Lamberson, Robert Lamberson, Rachel LaRue, Adeline Lauderback, Harrison Lauderback, Joseph Lauderback, Levi Lawrence, Oscar Lawrence, Frank Lee, John Lee, George Leffingwell, Josaphine Leffingwell, Myron Leffingwell, William Leffingwell, William Leiphart, Dyre Leonard, John Leonard, Martha Leonard, Mira Leonard, Effie Lesser, John Lesser, Ada Lewis, Claud Lewis, George Lewis, Harry Lewis, Jacob Lewis, James Lewis, Joseph Lewis, Kate Lewis, Lillie Lewis, Mary Lewis, William Lewis, Della Lindenmuth, Frank Lindenmuth, Bridget Little, Catherine Little, Jesse Little, Patrick Little, Cyrus	Lohr, Frank	Lohr, Howard Lohr, Alta Long, Bessie Long, Charles Long, Edgar Long, Elmer Long, Esler Long, Gertrude Long, Jerome Long, Oscar Long, Wilson Long, Delos Longan, John Longan, Asabel Lord, Enoch Lord, Freddie Lord, Luther Lord, Henry Love, James Love, John Love, Robert Love, Tracy Love, George Loverdy, Harry Loverdy, John Lownsberry, Wilbur Lownsberry, Lucius Lowry, Samuel Lowry, Dessie Luckhardt, Mary Luckhardt, Thomas & Luckhardt. George Machemer, Llewellyn Machemer, Stephen Madden, Willard Madden, Willard Madden, Benjamin Mahan, Esther Mahan, Thomas Mahan, Thad Mahon, Thaddius Mahon, Daniel Malone, Edward Malone, Rose Manalis, William Manalis, Charles Marks, John Marks, W. V. Marquis, Charles Martin, Evelyn Martin, George Martin, Jennie Martin, John Martin, L. C. Martin, Thomas Martin, Thomas Martindale, Frederick Masonheimer, George Masonheimer, Sarah Masonheimer, Edna Massner, John Massner, Fred Mathews, James Mathews, Thomas Mathews, Anna Matson, George Matson, Milo Matson, Benjamin Maul, Daniel Maul, Joseph Maul, Daniel Maxey, Lizzie Maxey, William Maxey, James Maxwell, William Maxwell, Jessie May, Samuel May, Charters McCann, Robert McCann, Levi McCauley, Lou McClune, S. McClune, Carrie McCluskey, Peter McCluskey, Ralph McCluskey, James McConnell, Jerome McConnell, Pearl McConnell, Henry McCormick, Jennie McCormick, Marrian McCormick, Anna McCue, Charles McCue, Daniel McCue, Edward McCue, Selma McCue, James McCune, Clara McCurdy, Harry McCurdy, John McCurdy, Margaret McCurdy, Robert McCurdy, Howard McElrath, John McElrath, Benjamin McElroy, Budd McElroy, John McElroy, Jessie McFadden, Reid McFadden, Flora McGaughey, Edward McGowan, Washington McGowan, Frank McKain, James McKain, Charles McKee, Clifford McKee, Harry McKee, James McKee, David McKelvey, Harvey McKelvey, James McKelvey, Sarah McKelvey, Sallie McKibbin, Allen McKnight, Irene McKnight, John McKnight, Nina McKnight, Ernest McLain, Francis McLain, George McLaine, Helen	McLaughlin, John McLaughlin, Oliver McLaughlin, A. E. McMeekan, Carrie McNeel, John McNeel, Claude McPherson, Frances McPherson, James McPherson, Lottie McPherson, Martha McPherson, Samuel McPherson, Wesley McPherson, Sadie McQuilken, Harry McWhorter, Stewart McWhorter, William McWhorter, Alice Mechling, Edwin Megargell, Harvey Megargell, Marion Megargell, Urbin Megargell, Carrie Mellen, Lottie Mellen, Robert Mellen, William Mellen, Reuben Mengle, Annie Meredith, Howard Meredith, Samuel Meredith, Samuel Merriman, William Merriman, Charlotte Meyers, Samuel Meyers, Seth Meyers, Ethel Michael, William Michael, C. E. Mickey, Charles Miller, Elmer Miller, Floyd Miller, Harvey Miller, Henry Miller, Jacob Miller, James Miller, Jasper Miller, Jeremiah Miller, John Miller, June Miller, Leathia Miller, Marion Miller, Mary Miller, Owen Miller, Samuel Miller, Sarah Miller, Abraham Milliken, Charles Milliken, Leah Milliken, Augustus Minney, Clara Minney, Hannah Minney, Harry Minney, Elisha Mitchell, John Mitchell, Russell Monoghan, William Monoghan, Estella Monroe, James Monroe, Thomas Monroe, David Montgomery, Laura Montgomery, Lizzie Montgomery, Samuel Montgomery, Thomas Montgomery, William Montgomery, Albert Moore, John Moore, Minnie Moore, Robert Moore, Charlotte Morden, Florence Morden, George Morden, Daniel Morgan, David Morgan, Elizabeth Morgan, Francis Morgan, Gwendolin Morgan, Richard Morris, Thomas Morris, James Morrison, George Morrow, Thomas Morrow, Anna Morton, George Mowers, Russell Mowers, Charles Moyer, Elmer Moyer, Francis Moyer, John Moyer, Susannah Moyer, Adam Munn, William Munn, Alexander Murphy, James Murphy, Jeremiah Murphy, John Murphy, Martha Murphy, Mary Murphy, Rachel Murphy, Annie Murray, Lewis Murray, William Murray, Daisy Myers, Edith Myers, Frederick Myers, Henry Myers, & Nora Myers. J. A. Naylor, George Neff, William Neff, Gertrude Neide, John Neide, John Neuman, Usa Neuman, Henry Newbury, William Newbury, John Newman, Julius Newman, Anna Newton, Henry Newton, Robert Newton, Howard Nichols, Thomas Nichols, George Nicholson, Lacy Nicholson, Thomas Nicholson, Edison Nickel, James Nickel, Solomon Nickel, B. L. Northrop, & Fauton Northrop. Matthias Oliver, Myra Oliver, Joseph Oller, Joseph Oller, Albert Osborn, Ross Osborn, Caroline Ostrander, Reuben Ostrander, William Ostrander, Thomas Ottey, Georgey Owens, Oscar Owens, William Owens, Edward Oyster, & John Oyster. Horace Paisley, Robert Paisley, Edward Parsons, Eva Parsons, George Parsons, Harrison Parsons, Mary Parsons, Elizabeth Patterson, J. D. Patterson, Martha Pearson, William Pearson, David Pease, Leroy Pease, Cameron Peck, Franklin Peck, Ida Peck, Lillie Peck, Percy Peck, Simon Peck, William Peck, Charles Pennypacker, F. B. Pennypacker, F. G. Pennypacker, Etta Perry, George Perry, Joseph Perry, Alexander Phillips, David Phillips, David Phillips, Francis Phillips, Margaret Phillips, Dora Pick, Frederick Pick, Ella Pillsbury, Henry Pillsbury, Nettie Pillsbury, Rhoda Pillsbury, Homer Platt, William Platt, Florence Ploof, James Ploof, Willis Ploof, John Pomeroy, Clarence Presberry, Stephen Presberry, Stephen Presbery, Katie Pryor, Thomas Pryor, Asa Pyle, Clinton Pyle, & Erastus Pyle. Horace Quick, & Katharine Quinlan. Robert Raffensberger, William Raffensberger, Andrew Rager, Bertie Rager, James Rager, Martha Rager, Edna Randall, Francis Randall, Ella Rankin, James Rankin, Martha Rankin, Robert Rankin, Samuel Rankin, Isaac Rathbun, William Rathbun, Charles Ray, George Ray, Harvey Reddick, Susie Reddick, Sarah Redding, Calvin Reed, David Reed, Harry Reed, Howard Reed, John Reed, Robert Reed, Henry Reichard, James Reichard, Hulda Renfrew, George Reynolds, Leroy Reynolds, Randolph Reynolds, Theodore Reynolds, Amos Rhodes, Daniel Rhodes, George Rhodes, Henry Rhodes, James Rhodes, Leon Rhodes, Lillie Rhodes, Carrie Rich, Florence Rich, Israel Rich, Nellie Rich, Charles Richards, Francis Richards, James Richards, Jason	Richards, Mary Richards, William Richards, Elmer Richardson, James Richardson, Charles Rickson, John Rickson, Charles Rinker, Kate Rinker, Hiram Robbins, Hiram Robbins, Thomas Roberts, Albert Robinson, Fannie Robinson, Flossie Robinson, George Robinson, Maria Robinson, Rubie Robinson, Thomas Robinson, William Robinson, Catherine Rodgers, Elizabeth Rodgers, James Rodgers, Wallis Rodgers, William Rodgers, George Roland, Raymond Roland, Ruth Roland, George Rollings, John Rollings, Rose Rollings, Isaac Rollins, Nettie Rollins, Esther Root, Albert Rose, Alfred Rose, Edward Rose, Thomas Rose, Viola Rose, William Rose, Bessie Rowe, George Rowe, Benjamin Royer, Charles Royer, Anna Rufe, Charles Rufe, Elmer Rufe, Mamie Rufe, Benjamin Rush, Howard Rush, Ida Rush, Jesse Rush, Lewis Rush, Louis Rush, Robert Rush, Thomas Rush, Bessie Russell, Helen Russell, James Russell, John Ryan, Thomas Ryan, Charles Rynearson, Cornelius Rynearson, Ira Rynearson, Israel Rynearson, & Sarah Rynearson. Emma Salsman, Thomas Sample, Thomas G. Sample, Adelia Sampson, Grace Sampson, Luther Sampson, Maude Sampson, Anna Sanders, Arthur Sanders, Jacob Sanders, Roland Sanders, Leon Sawyer, Robert Sawyer, George Saxer, Abner Say, Walter Say, Goldie Scharr, Jacob Scharr, Maggie Scharr, Robert Scharr, William Scharr, Ethelbert Seeds, Isaac Seeds, Sarah Seeds, George Sellard, John Sellard, Benjamin Sellers, Clara Sellers, Franklin Sellers, Milroy Sellers, Florence Seneff, George Seneff, Henry Seneff, Emma Shaffer, Ralph Shaffer, Terry Shaffer, Thomas Shaffer, William Shaffer, Frank Shaner, Harry Shaner, John Shaner, Patrick Shaner, Joseph Sharp, William Sharp, Ellen Shaw, James Shaw, Sarah Shay, Adam Sheckler, Fannie Sheckler, John Sheckler, Leah Shellenberger, Cassius Shepler, Harry Shepler, Junius Shepler, James Sheppard, Lavere Sheppard, Catherine Sheridan, John Sheridan, Joseph Sherwood, Minnie Sherwood, Robert Sherwood, Archibald Shields, James Shields, Tillie Shields, John Shipton, Thomas Shipton, Edward Shirley, Ida Shirley, William Shirley, Earl Shives, Francis Shives, Sylvester Shives, Effie Shoemaker, Blanche Showalter, George Showalter, Blanche Shrom, John Shrom, Mary Shrom, Charles Sias, Hattie Sias, William Sias, Carrie Sickenberger, Ellsworth Sickenberger, Lisle Sickenberger, Sebastian Sickenberger, Tracey Sickenberger, George Sincely, Olive Sincely, Samuel Sincely, George Skinner, W. F. Skinner, David Slanker, Hannah Slanker, Margaret Slanker, Alice Small, Charles Small, John Small, Jacob Smalley, John Smalley, Shinklof Smalley, Aaron Smith, Albert Smith, Amos Smith, Annie Smith, Arthur Smith, Bertha Smith, C. H. Smith, Charles Smith, Earl Smith, Emma Smith, F. W. Smith, Francis Smith, Frederick Smith, H. B. Smith, James Smith, Jennie Smith, Jessie Smith, John Smith, Laura Smith, Lena Smith, Lillie Smith, Martha Smith, Mary Smith, Minnie Smith, Monroe Smith, Robert Smith, Samuel Smith, Thomas Smith, Willard Smith, Abel Snow, Alvira Snow, Alec Snyder, Charles Snyder, Edward Snyder, Jacob Snyder, Jewel Snyder, Leroy Snyder, Nellie Snyder, Ruth Snyder, Timothy Snyder, William Snyder, William Snyder, Charles Sodan, John Sodan, Leroy Sodan, Mary Soley, Wesley Soley, George Somerville, William Somerville, Israel Sowers, Michael Sowers, Bertha Sproat, Joseph Sproat, Philip Sproat, Abram Stahl, Daniel Stahl, Lucy Stahl, Warren Stahl, Jacob Stahleber, Tillie Stahleber, H. E. Stahler, Florence Stare, George Stare, George Staub, Reuben Staub, Clifford Steen, Harry Steen, Hazel Steen, William Steen, Frank Steenburg, Peter Steenburg, Rose Steiner, William Steiner, Robert Stephenson, Samuel Stephenson, David Sterling, Jabez Sterling, Lena Sterling, B. F. Sterner, Eleanor Sterrett, Lewis Steward, Barbara Stewart, Birney Stewart, David Stewart, Elizabeth Stewart, William Stewart, Cecil Stiles, Jonas Stiles, Jacob Stineman, Franklin Stivanson, James Stivanson, Nancy Stivanson, Earl Stockwell, Leonard Stockwell, Benjamin Stone, George Stone, Hattie	Stone, Henry Stone, Jacob	Stone, John Stone, Vertulau Stone, William Stone, David Stoner, Edward Stoner, Annie Straub, Edward Straub, Harry Straub, Summerfield Straub, William Straub, John Stringfellow, Joseph Stringfellow, Sarah Stringfellow, Hiram Strope, Nathaniel Strope, Nellie Strope, Rachel Strope, Eva Stuchell, John Stuchell, Mable Stuchell, William Sturgeon, Augustus Stutzman, Carrie Stutzman, Paul Stutzman, James Sullisburg, Cornelius Sullivan, Francis Sullivan, Harry Sullivan, Jeremiah Sullivan, Joseph Sullivan, Sadie Sullivan, William Sullivan, Edward Swab, Joseph Swab, Anna Swackhammer, Maria Swackhammer, Daniel Swartz, Salome Swartz, Elmer Swartzlander, Naomi Swartzlander, Sylvania Swartzlander, William Swartzlander, Laura Swentzel, & Laura P. Swentzel. Amor Tailey, Margaret Tailey, Alena Tarbox, Bessie Tarbox, Jessie Tarbox, Maud Tarbox, Samuel Tarbox, Adrian Taylor, David Taylor, Minerva Taylor, Preston Taylor, William Taylor, Emmet Teel, Ferdinand Teel, Martha Teel, Frank Terry, Frank Terry, Samuel Terry, Clara Thomas, John Thomas, Lillian Thomas, Richard Thomas, Elias Thompson, Ellen Thompson, Mary Thompson, Polly Thompson, Sarah Thompson, Thomas Thompson, William Thompson, M. L. Thounhurst, Artemisha Torpy, Augustin Torpy, David Townsend, Hugh Townsend, Charles Tucker, Emily Tucker, Silas Tucker, Frank Turnbaugh, John Turnbaugh, Anna Turner, George Turner, Joseph Turner, Albert Turney, Clyde Turney, & Daniel Turney. John Ukkerd, Philip Ukkerd, & Fred Ulrich. Nora Van Baman, Burt Van Buskirk, Grace Van Buskirk, Judson Van Buskirk, Mabel Van Buskirk, William Van Buskirk, Benjamin Van Horn, Charles Van Horn, Walter Van Horn, Lewis Van Wie, Daniel Vanetta, Jacob Vanetta, Lucy Vanetta, Elisha Vanwormer, Harry Vanwormer, Bessie Varner, Edgar	Varner, John Varner, Lester Varner, Lillie Varner, Melissa Varner, Arthur Varney, John Varney, Joseph Varney, Dexter Very, Luther Very, John Vincent, Nora Vincent, Louis Vogel, Robert Vogel, & William Vogel. Elijah Wade, Ralph Wade, Thomas Wainwright, Walter Wainwright, Alexander Waite, Florence Waite, Clara Walkemeyer, Ella Walker, George Walker, William Walker, Benjamin Wallace, John Wallace, Margaret Wallace, William Wallace, Howard Walters, Jacob Walters, Ray Walters, Reuben Walters, Jesse Walton, Walter Walton, W. J. Wambaugh, Andrew Wandall, James Wandall, Jessie Wandall, Clayton Warner, John Warner, Kate Warner, Charles Warnick, Conrad Warnick, Benjamin Warren, Lida Warren, J. A. Waters, Dennis Watson, John Watson, Alexander Watt, Clara Webster, John Webster, Annie Weise, Daniel Weise, Stella Weise, Charles Weisel, John Weisel, John Weisel, Emeline Wells, John Wells, Mabel Wells, Stephen Wells, Thurman Wells, Harry Welmer, John Welmer, Allen Welsh, Rice Welsh, John Weltmer, L. L. Welty, Russell West, Samuel West, Annie Wharton, Grant Wheeler, Ray Wheeler, Samuel Wheeler, Frederick Wheelock, Mary Wheelock, Willis Wheelock, Laura Whipple, Albert White, Commodore White, George White, George White, Helen White, James White, Margaret White, Ruth White, Ebenezer Whitney, George Whitney, Almander Wilbur, Jesse Wilbur, Susan Wilbur, Amanda Wiley, Benjamin Wiley, Charlotte Wiley, George Wiley, Daniel Wilhelm, David	Wilhelm, Dora Wilhelm, S. G. Willauer, Andrew Williams, Edward Williams, Jacob Williams, Alfred Willis, James Willis, Jeanette Willis, Arthur Wilson, Edith Wilson, Frank Wilson, Robert Wilson, Stella Wilson, Thomas Wilson, Edwin Wise, Henry Wise, Richard Wize, Stella Wize, William Wize, George Wolcott, Richard Woolridge, William Woolridge, Alfred Wooster, Le Roy Wooster, Maude Wooster, Geneva Wray, Helen	Wray, John Wray, William Wray, Merton Wright, Rue Wright, Ruth Wright, Cora Wyncoop, George Wyncoop, John Wyncoop, George Wynkoop, & Hobart Wynkoop. Franklin Yaple, Harry Yaple, Albert Young, Charles Young, Erastus Young, Franklin Young, George Young, Howard Young, Jacob Young, John Young, Joseph Young, Katie Young, Mary Young, Thomas Young, & Jacob Youst. Charles Zachringer, Walter Zachringer, Jacob	Zimmerman, Mary Zimmerman, William Zimmerman, Lucy Zorn, & Michael Zorn.